Jenna has been with us for just under a year and has fitted into the Shamwari team well! 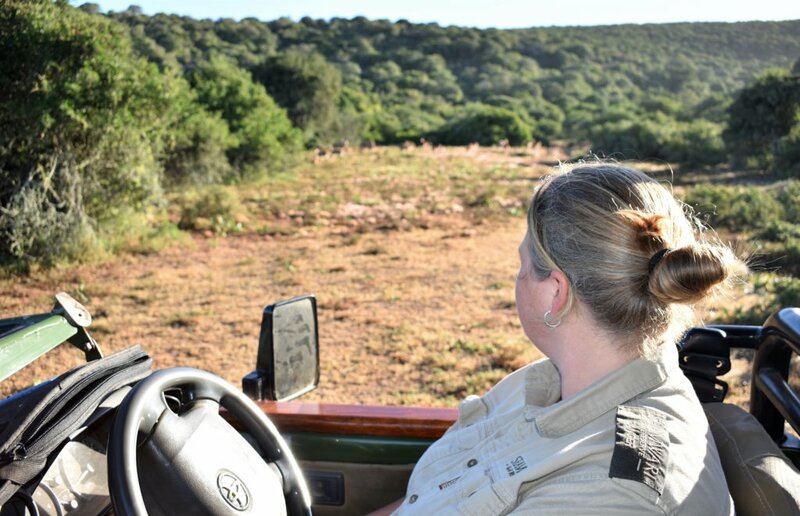 She is just as passionate about people as she is about wildlife and loves showcasing what Shamwari has to offer to our lovely guests. 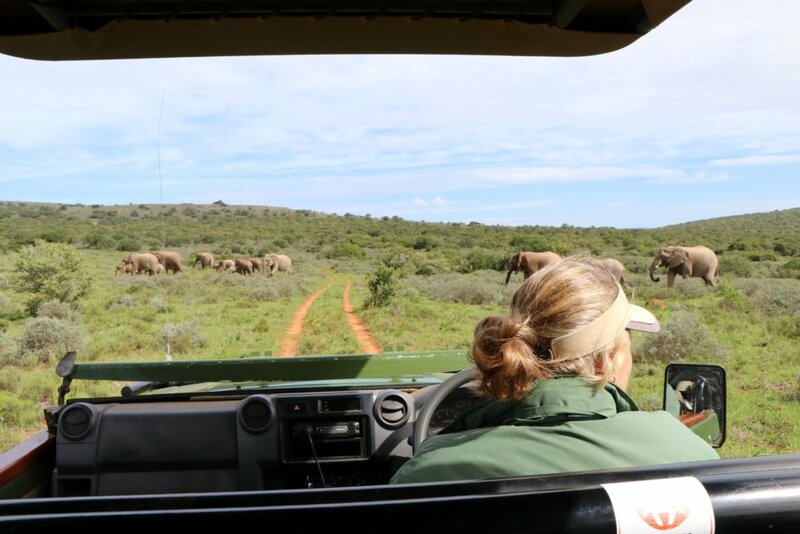 Previous roles: 10 years in an administrative role, a cheetah handler at Inverdoorn Game Reserve and a Ranger at Amakhala Game Reserve. I’m passionate about travel and about learning new things. I guide because I have a passion for nature and animals but I’m mostly passionate about the people I get to meet along the way. For the small moments, it’s not necessarily about the big 5, it’s about nature surprising you in the little ways. I also thoroughly enjoy people coming on safari for the first time and seeing their reactions to the things they see and experience. The awe on their faces witnessing wildlife in their natural environment. They’re always animated, you can watch them for hours! Particularly the young playing together and watching them figure out how their trunk works for instance. It is so hard to pick one sighting as a favourite. I have had the absolute privilege of witnessing several amazing sightings at my time at Shamwari. From watching a Black-backed Jackal being chased by a Secretary Bird for 20 minutes, to watching the first steps of a newborn zebra. I have been lucky enough to witness a mother cheetah training her four cubs how to hunt, and also to see a White Rhino scratching his belly on a termite mound. The sightings are made memorable for me not just by what the animals are doing, but also by the guests’ reactions to what they are seeing, knowing that they are experiencing something that they will never forget. So to pick one favourite is near impossible. However, I will relate the story of my most recent favourite sighting. About a week ago I spent two nights guiding a lovely family of 4 from Perth. On their second day at the reserve we had a picnic lunch at Long Lee Lapa followed by a game drive to the Northern part of the reserve to find some elephants. After the long journey there I spotted one or two elephants from the ridge overlooking the valley where I expected to find them. We made our way down into the valley and came across 2 bulls. After enjoying them for a bit we went in search of the herd. We seemed to be having a bit of bad luck finding them, so we circled back to where we had initially seen the 2 bulls. Just behind them in the distance we noticed two elephants heading over to Springbok Dam (a lovely deep dam where the they often like to swim). We made our way over and were blessed with a fantastic sighting. It started as just a small herd with 2 young calves drinking from the dam. Two young males then decided to get in and have a swim and played beautifully for us dunking each other under the water and play fighting. The rest of the herd moved over to the grassy area where they proceeded to lie down on the lawn and roll around as a dog would do. It was incredible to witness. Luckily it was a very quiet afternoon in the bush and we had the joy of watching the herd for about an hour. Over that hour, more elephants kept coming out from the dense thicket to enjoy the foray, one young male joining the other two in the water. It was an amazing spectacle and one I will not forget. To make the day extra special we were treated to the sighting of one of the Northern Pride’s male lions on the way home, walking along the road.